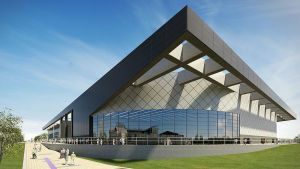 Over 50,000m of Prysmian FP200 Gold and FP600S have been installed in the Sir Chris Hoy Velodrome, part of the National Indoor Sports Arena and Velodrome (NISA) in Glasgow. The Velodrome will contain a 250m high banked wooden cycle track and an infield area for the cycling events at the 2014 Commonwealth Games. The entire complex will be one of the largest indoor sports facilities of its kind in Europe once it reaches final completion in March 2012. Work began on the Velodrome in November 2010 and both the FP200 Gold and FP600S were installed by February 2011. The Velodrome’s capacity will be expanded to 4,000 seats during the Commonwealth Games. The 20th Commonwealth Games will take place for 11 days between 24th July and 3rd August 2014. Seventy-one countries will participate, making it the largest sporting event to have taken place in Scotland.